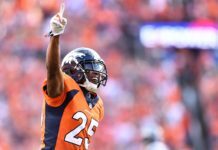 The Denver Broncos’ last gameday of the 2017 season began with whispers and ended with a whopper of a finish. 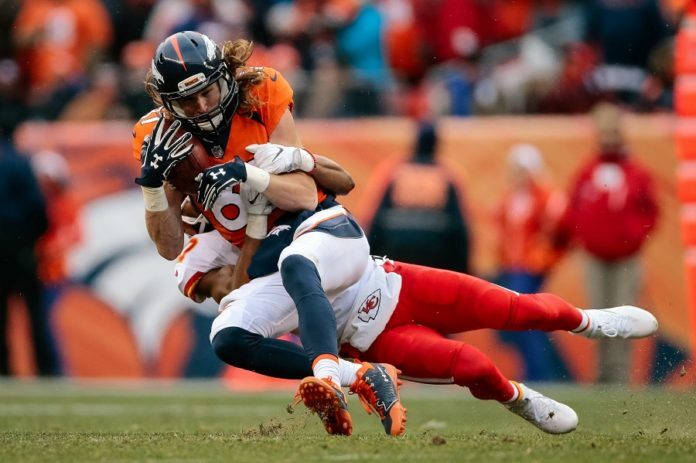 The Broncos fell to the Kansas City Chiefs in their season finale, a game that often felt more like a preseason scrimmage than a contest that could ultimately determine the fate of first year head coach Vance Joseph. That was up until the final minutes, when a Denver scoop and score kick-started a late rally that ultimately tied the game with two minutes and fifty three seconds to play. 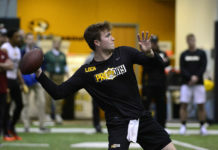 It featured a sterling performance from Kansas City’s rookie quarterback Patrick Mahomes, who led Kansas City’s game winning drive, a valiant effort by Broncos running back C.J. Anderson, and ultimately a welcome end to a dreadful 2017 season. Below are some notes and observations made throughout Denver’s final game of the 2017 season. Broncos fans remain some of the best in professional sports. It’s a meaningless game in essentially zero degree weather, but these fans still show up in spades. Yes, there were empty seats. But, the fact that anyone showed up at all is a testament to the dedication of the fan base. An estimated 67,000 fans came out to this game. They deserve a better product in 2018. The day began with ESPN’s Adam Schefter tweeting that Vance Joseph was suddenly very much on the hot seat. His players didn’t exactly look determined to help him keep his job. Even in the early going they played with little intensity or interest. The first Kansas City drive of the game went 86-yards in 57 seconds. That doesn’t bode well for a coach desperately holding onto his job. Jordan Taylor continues to impress in the punt return game. He’s not flashy. He’ll probably never break one. Yet, he’s smart, sure handed, and savvy back there. If he can work to become a better athlete during the offseason, he’s going to do big things at that position. He also made an acrobatic catch in this game that should bode well for him as Denver tries to sort out a crowded receiving corps this offseason. Broncos’ second year quarterback Paxton Lynch has likely played his last game for Denver. After a quality start, he struggled mightily from the second quarter on. Lynch, who came into the league as only of the most highly touted athletes in recent memory, has proven to be a disappointment. He is a phenomenally gifted athlete. However, playing quarterback in the NFL isn’t track and field. It requires intense mental focus and a burning desire to compete on every single play. Lynch doesn’t have that. Every time he drops back he looks a little like he’s just coming out of a coma and is stunned to find himself on an NFL field. It’s a extremely disappointing outcome for this organization. He has physical gifts. He showed them off on a late touchdown drive. However, his overall body of work for the Broncos still leaves much to be desired. Adding insult to injury, Kansas City’s rookie gunslinger Pat Mahomes proved to be everything Lynch was not in this game. He threw off balance, found open receivers, showed impressive mobility both in and out of the pocket, and made several jaw dropping throws. He’s an impressive young talent and could be a force in the AFC West for years to come. The Broncos honored former All-Pro left tackle Ryan Clady in the first quarter of the game. It was a painful reminder of just how far this team has fallen along the offensive line. That unit has been better this season than last, but there is still a mountain of improvement that needs to be made. Expect that front five to be a top priority in the draft and during free agency for John Elway and company. Denver clearly came into this game looking to get the ball to C.J Anderson as he marched towards his first 1,000-yard rushing season. He got there with 11:36 to play in the game. While 1,000-yards isn’t what it used to be, it shows Anderson really is the grinder he’s always claimed to be. The Broncos would be wise to keep him in the mix next season. He’s still a hardworking downfield runner with good vision and an impressive cut. The Broncos are going to have several challenges to address this offseason. Above all, though, they need direction and stability. They need a plan. Developing one and executing on it must now be the top priority of this organization if the’re going to avoid seasons like this in the future. This team knows how to compete. They know how to battle. 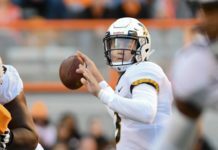 They showed that late in this game, but they need stability at the head coaching position and a long-term answer at quarterback before they return to the field next fall.